FTDI, available through Glyn High-Tech Distribution has launched a new low-cost development platform for embedded systems. 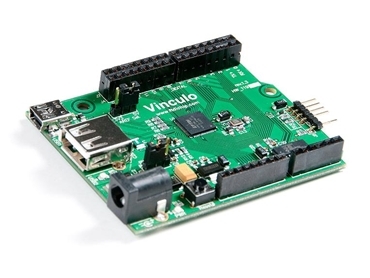 USB silicon and software specialist Future Devices Technology International Limited (FTDI) has unveiled the Vinculo embedded development platform inspired by the popular Arduino Duemilanove/ Uno. Featuring USB Host/Slave controller with integrated 16-bit CPU, the Vinculo development platform creates new possibilities for cost-effective embedded design. Firmware can be developed using the Vinculum II development tool chain, which provides an integrated development environment (IDE) including C compiler, assembler, linker and debugger tools. FTDI provides robust device class driver libraries including USB Mass Storage, HID (Human Interface Devices), Printer Class, Image Class, Communication Class and Instrumentation. FTDI’s CEO and founder Fred Dart comments that the Vinculo module and associated design tools provide a low cost but full featured solution for embedded designs with the bonus of flexible USB host and device connectivity.